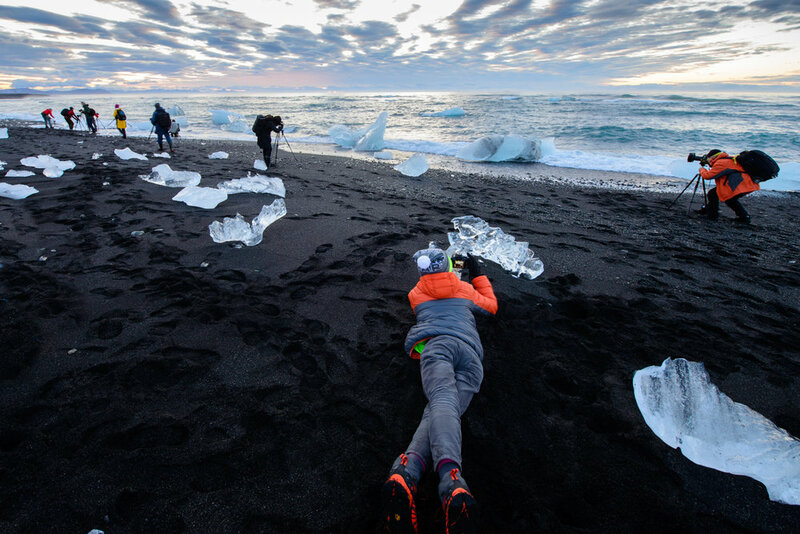 This past September BlueHour led its first tour group through Southern Iceland. 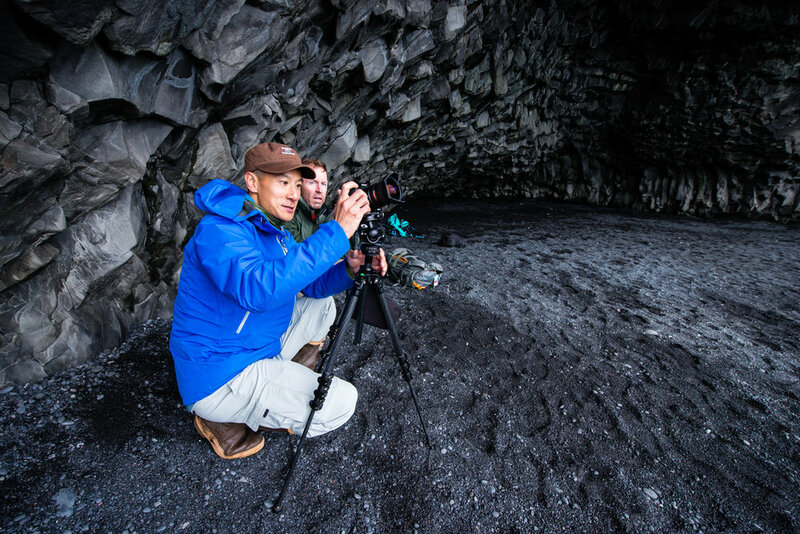 Paul and I were very excited for this trip since it was our first time leading a group of this size internationally (8 photographers) and Iceland is ripe for amazing photography. We arrived at 4:30 in the morning - the time you'll almost always arrive when flying to Iceland - and our first task as guides was to pick up the rental vehicle. Our rental was a massive 17-passenger, manual transmission van, which took some time to get used to. We can now put that notch in our belt. Our first stop with the group was sunrise at the Gunnuhver steam vents, which was incredible to see with the golden rays of sun shining through billowy steam. After many photos were taken and the amazement subsided (a little bit) and the chill of the morning wind set in, we treated everyone to all-you-can-eat lobster soup at Bryggjan in nearby Grindavik - a stop we'll be keeping for the future. Our next stop was one that many were looking forward to - The Blue Lagoon! 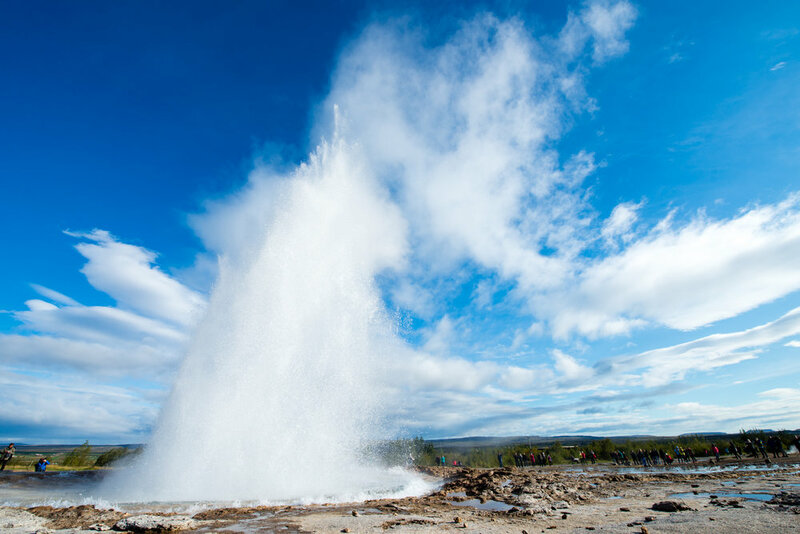 This is really a must-do if you're in Iceland even for a day; it is only 20 minutes from the airport and is a luxurious and out-of-this-world experience in the morning hours. The blue color comes from the silica and minerals naturally in the water, which also help rejuvenate your skin. The Blue Lagoon is not only a spa, but also a research facility and outpatient clinic for skin ailments. And in case exfoliation isn't your main priority in coming here, this geothermal area also produces some otherworldly images and videos. From here on out we moved East. 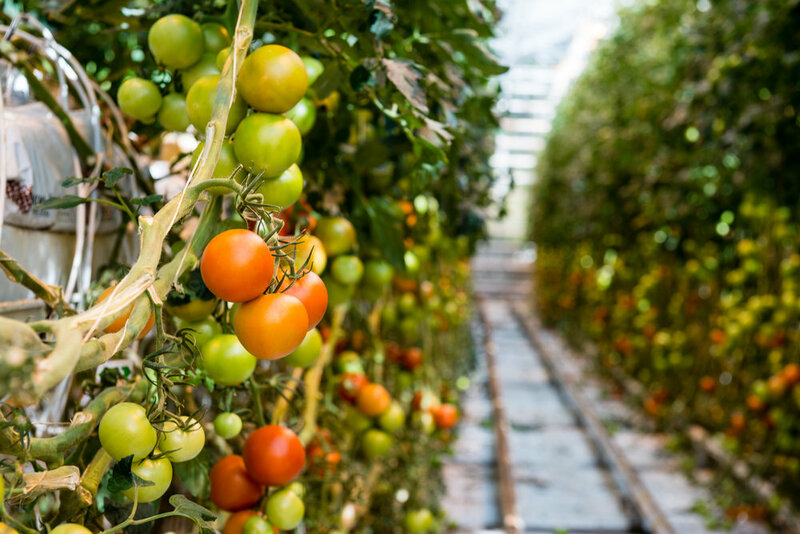 We toured the Golden Circle - a geothermal area that is a tourist favorite, which include sights like Thingvellir, Geysir/Strokkur, Gulfoss, Seljalandsfoss, Skogafoss, and the Fridheimar tomato farm where we had a delicious lunch. We were going to have a blazing sunset this day, so we made sure to be at the right place at the right time. We stopped at Bruarfoss, known for it's very blue water. If you have the proper footwear, you can get up close and make some compelling images. And we did something new for both Paul and I: we took a trip to Landmannalaugar, the Icelandic highlands. This area is a little over two hours away but if you make the trip, you can see the painted hill-like landscape, which is entirely different from anything you'll see along the southern coast. 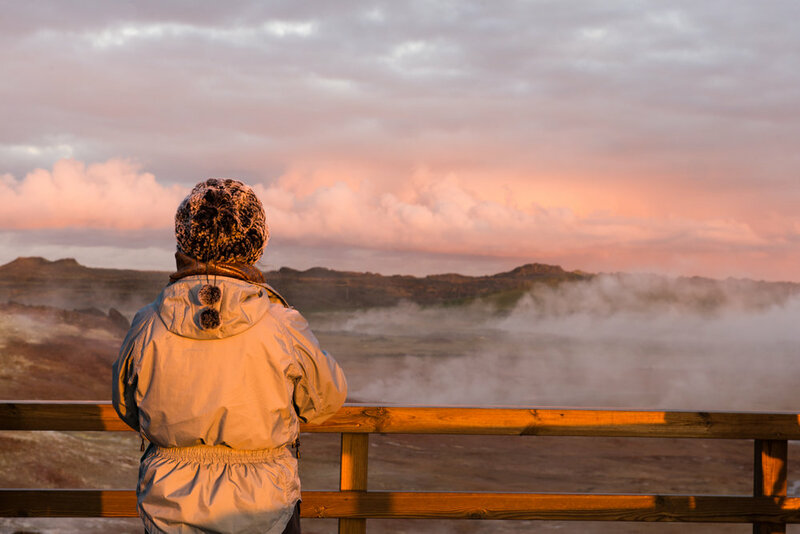 There are natural hot springs here you can take a dip in, many hiking paths, and you can even see the Hekla volcano. Later at the hotel, many in our group (including me) were treated to another first: the northern lights. Though there were many lights blaring from the hotel behind us, we watched the sky as the green lights danced. Didn't matter I had just got out of the shower and had soaking wet hair with no coat on, I made a shot! As we traveled east the next day, we visited the small town of Vik, Dyrholaey (the arch), and the famous black sand beach: Reynisfjara which is known for its impressive basalt columns and sea stacks. Reynisfjara is an incredible spot for interesting compositions, whether you like to get up close, or capture sweeping landscapes. It's also a great place to practice your black & white photography. Just be mindful of the tide, since this beach can be dangerous and is known for rogue waves that have claimed many cameras! The next shoot, and our last day before heading back West was the one we had all been waiting for: Diamond Beach at Jokulsarlon. 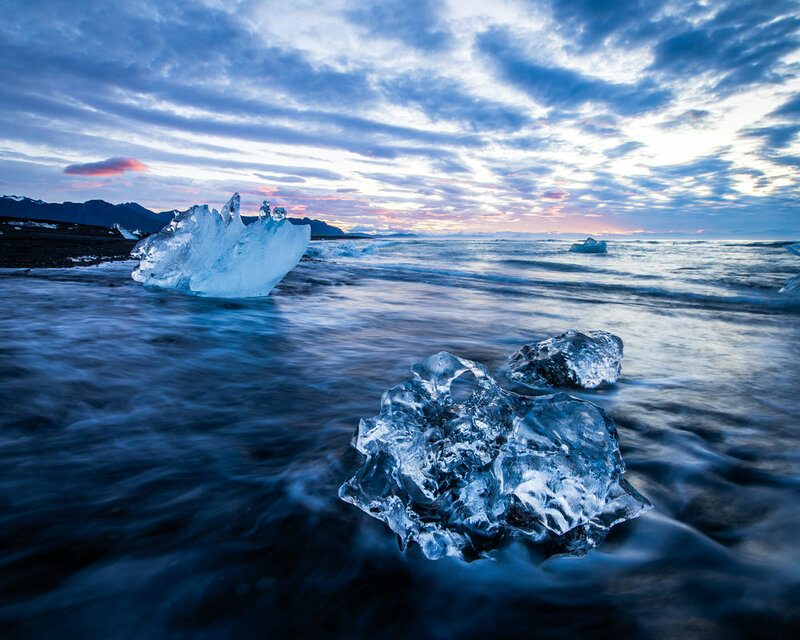 The glacial lagoon known as Jokulsarlon is the crown jewel of Iceland for photographers. If you show up for sunrise, be prepared to face off with many others with cameras. Pick your compositions early and stick to them, because you might not get your spot back! We had more than perfect conditions. 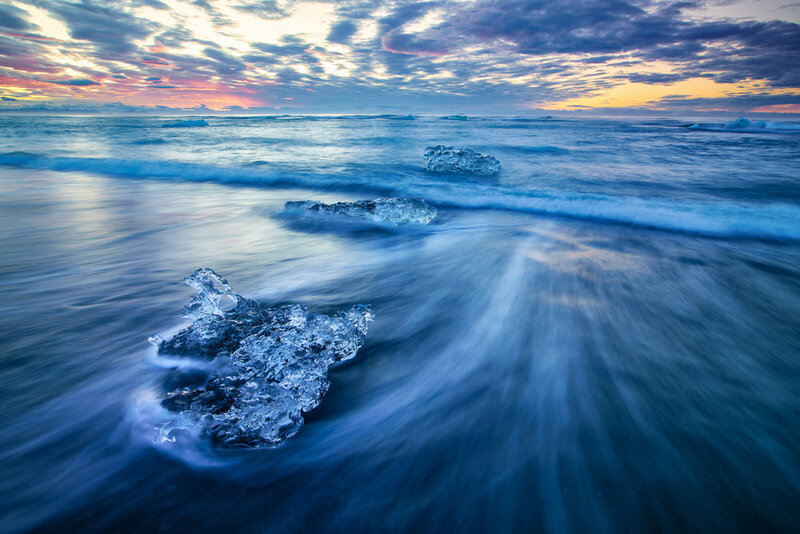 As the sun rises, the light filters through the icebergs that have washed onto the beach, making for some beautiful photographs. We could spend all day here. We've already launched our 2018 tour to Iceland, and we're counting down the days. 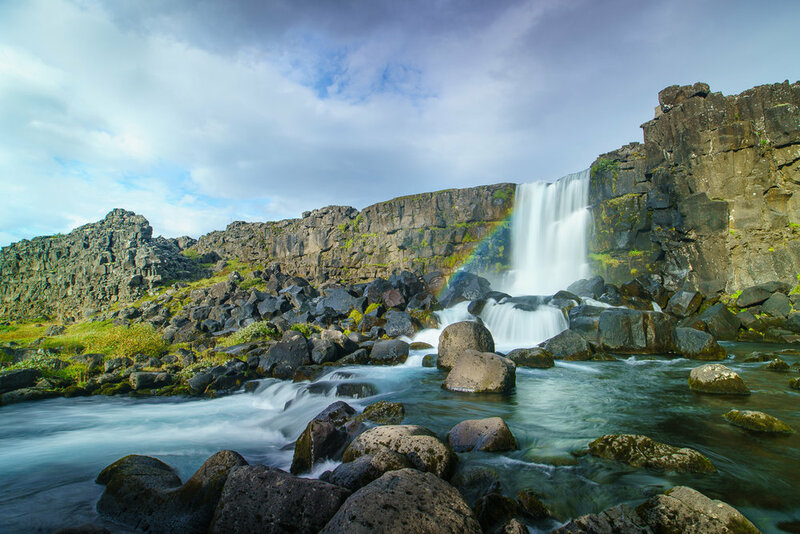 If you'd like us to guide you through Iceland's most picturesque locations at the right times, consider us for your Iceland photo-vacation! Here are some photos of our group from the week. 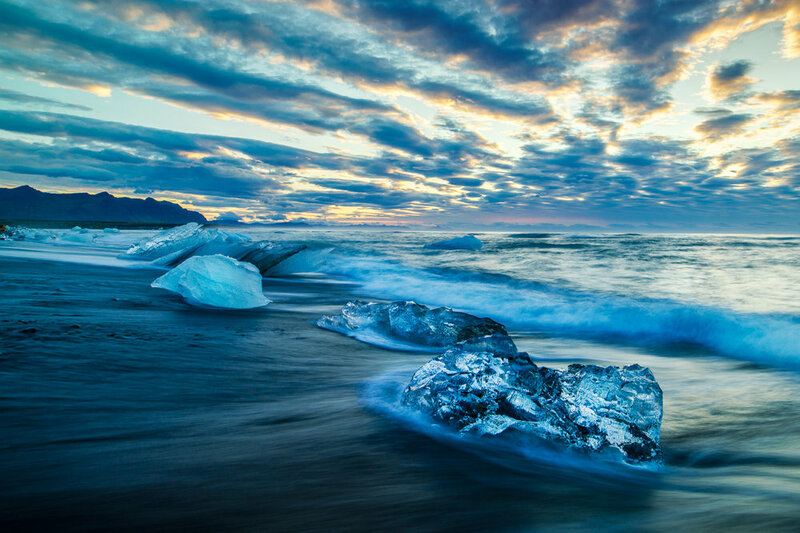 Who knows - we love it so much, we're even considering adding an entirely new itinerary to explore western Iceland!